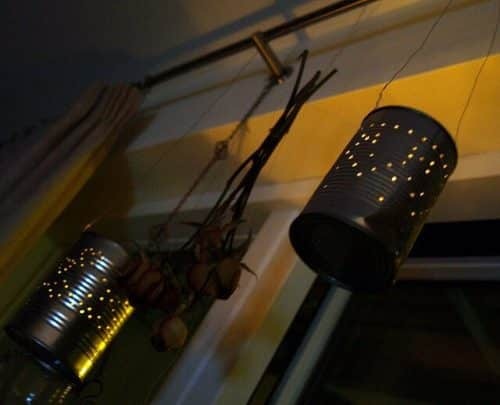 Have you ever wondered how to give your home pleasant lighting in the summer and make it cozy in the winter? The answer is by using candle lanterns! Summer presents opportunities to have picnics and enjoy grilling at backyard barbecues. You can enjoy cooler evening temperatures while eating and talking with your friends and family in the soothing light of your candle lanterns. You can either purchase a tall candle lantern or make one yourself. If you’d like to buy a lantern, a few great options you can try include an Imax Chatham tall candle lantern, an Evergreen Firekeeper round lantern, or a set of three lanterns from Battery Operated Candles & Tea Lights. All you have to do is to place the candles inside, and you’re all set. To make your own candle lantern, simply follow the steps below. Remove the label from the can; then fill it with water and freeze it overnight. This will help you drill holes into the can without changing its shape. You can now create a design or pattern for the tin. Draw a pattern on a piece of paper and tape it onto the can. You can use a 12×12 paper storage box to store your paper and keep your crafting area organized. Position a sharp nail above a mark on your pattern and tap it with a hammer three to four times or until a proper hole forms. Repeat this step for all of the marks on your pattern. Once you’ve finished drilling, wash your can under warm water; then remove the ice after it has melted slightly. You can decorate your can by using decorative items like round mirrors, ribbon or sparkle tape. You can also create fun designs on the can with the help of colorful permanent markers. Place some votive candles inside the can and light them up to create flickering patterns. Make sure you place the lanterns on a flat surface to avoid a fire hazard.